How's the ticker? Some dangerous heart problems can exist without any symptoms whatsoever, like "atrial fibrillation" (A-fib) a type of abnormal cardiac rhythm that affects one in four people. A visit to your physician is normally required to detect it (and is still a must), but a company called AliveCor has just announced that its AFib Dector algorithms have been approved by the FDA for professional or personal use. It consists of the company's $199 heart monitor (also available in an integrated iPhone 5/5s case, shown above) which attaches to an Android or iOS smartphone and rests on your fingers or chest to record your electrocardiogram (ECG). It then sends the info to your smartphone via an ultrasonic signal which is picked up by your phone's microphone, requiring much less power than a Bluetooth system. 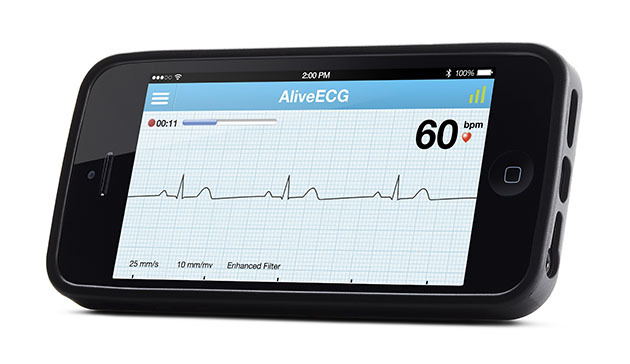 Via the AliveECG app, that info can be uploaded to AliveCor's servers, where the FDA-approved AFib Detector will give an almost instant, highly accurate interpretation for free. You can then send the information to a board-certified cardiologist or your personal physician, who can perform further tests to confirm the diagnosis. It sounds great and we're all for DIY health devices, but of course it's no substitute for a checkup -- if you have even the slightest doubt about your heart, ask your doctor.